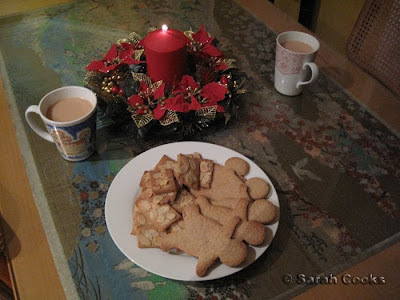 It was first Advent on Sunday last week, so it was time to light up the candles, and get my Christmas baking started! There are four Advents before Christmas, or as I like to think of them, four opportunities to get my baking on, hehehe! I decided on Spekulatius, from my Dr Oetker Backen Macht Freude book. 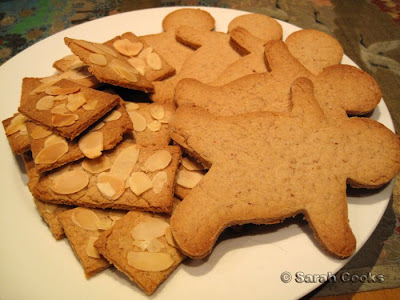 You might know these as spekulaas, those addictively crisp and spicy Dutch Christmas biscuits. Spekulatius is the German version. The dough includes almond meal, and a heady mix of cinnamon, ground cloves and cardamom. 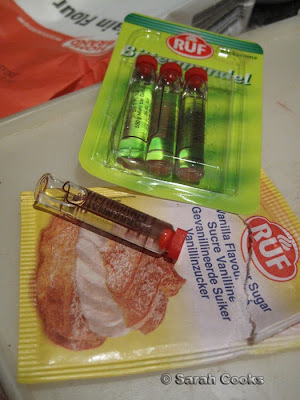 You just can't make German Gebäck without Vanillin-Zucker and little vials of Aromen! 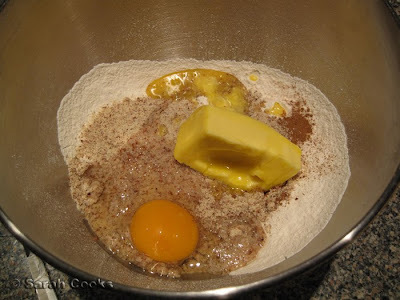 The instructions simply tell you to mix everything together and knead to a smooth dough. (At least I'm pretty sure that's what they said - they were in German, after all). 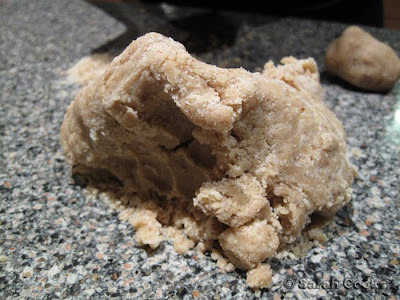 It took quite a bit of kneading to get a smooth dough - I think it might have been more effective if I'd creamed the butter and sugar first, and then added the rest of the ingredients slowly. 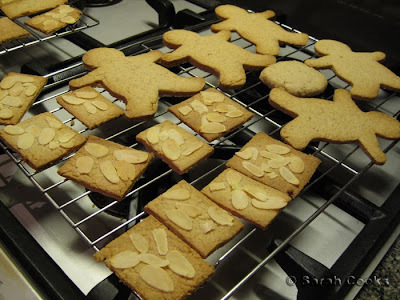 I didn't have a funky wooden mould like the one in the book's photo, so went for gingerbread-people, and rectangles with flaked almonds. These were lovely - just the right amount of spice, and a pleasantly chunky texture from the ground almonds. A few of the biscuits were slightly overcooked and hard; my bad, I should have taken them out of the oven when they had just turned a lovely light brown colour. Most of them, however, were just delicious. Your table looks so lovely, warm, and yummy! My Mom was a Christmas-cookie MANIAC. You're inspiring me to get back in the kitchen. I'm impressed with your big German words, too. Thank-you!! So good to hear from you. 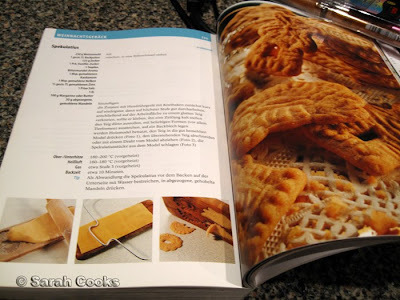 Definitely, start baking German Christmas cookies! Nothing better for creating Christmas cheer. I'm gonna take proper German lessons next year, YAY! Aw they look so cute AND yummy. Love all your Germanic cooking and baking. Those biscuits sound delicious with all those spices. I always get a bit nervous about overcooking a rolled-out-thin dough like that though! Oh and the video was bizarre but hilarious! Very camp, very kitsch. Those biscuits look yummy! I love all your German creations! It is a reminder that I should probably get started on my Christmas baking too! Yum! I can just imagine how good your house would have smelt with these in the oven. The ones with the almonds look really pretty! Laura - Yeah, totally! I always set the oven 5 minutes shorter than the recipe suggests, so I can check on them before they burn! Rilsta & Panda - Not sure why but I've been super-enthusiastic this year! Just made some fruit mince for mince pies tonight. SO need to go on a diet in the new year! Red - Yay! Plaetzchen-Fever! I love it!!!!!!! I'll look forward to reading your Vanillakipferl recipe, as I've seen a few that are very different. E.g. the one I use just has butter/vanilla sugar/flour and ground almonds, but I've seen ones with egg yolks and heaps of other ingredients.